So many makeup products these days give your skin a shimmery glow. You might be thinking why would I want shimmer, I'm not ten years old! Well, a little shimmer and sparkle isn't just for kids. Follow these tips on how to use shimmer to your advantage. Look for sheer options. Opt for lightweight shimmer products, not heavy opaque "frosty" makeup. Focus on one feature. You'll surely look like you got into mommy's makeup if you have heavy shimmer and shine on your eyes, cheeks AND lips. Pick one feature to shine. Go light-handed with application. Unless you're going for a costume look, apply products lightly. 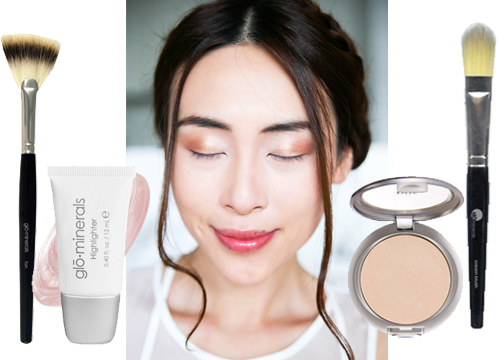 If you are going for a natural shimmering glow, then here is where you can add a little to the cheeks and the eyes - just don't overdo it! Try a multi-use highlighter. Yes, it can be daunting at first, but one great highlighter can do so many jobs. gloMinerals GloHighlighter can be applied before or after your foundation depending on how subtle you want your glow. Apply it to cheekbones, the brow bone, inner corner of eye or the center of lips for a hint of shine. Avoid shimmer on certain areas. Applying shimmer products to fine lines, wrinkles or blemishes will of course only highlight them, and that's definitely not the goal here. However, a lightweight powder like Pur Minerals Afterglow Illuminating Powder contains the natural shimmer of Mica to actually reflect light away from your imperfections. Always blend! This is the key to making your shimmer look natural. Use a gloMinerals gloTools Cream Blush Brush for creamy or liquid products and a gloMinerals gloTools Fan Brush for powder formulas. And be sure to only use this brush for your sparkling products, otherwise you'll end up with shimmer everywhere, all the time. Pur Minerals Hello Bright Eyes Defining Pencil adds the perfect amount of sparkle to the eye area, brightening your overall complexion and making your eyes pop. gloMinerals Alloy Eyes Collection is a beautiful 8-color eyeshadow palette that combines flattering shimmer and matte shades. Osmosis Colour Blush adds radiance to your cheeks without being overly shimmery so it's perfect for everyday wear. Until next time... stay tuned and stay beautiful.